I received my order from Emsy's Handcrafted Gifts @ Etsy today and it surpassed all my expectations. This is a seriously amazing shop and I'm super impressed! So here is my order! It's so stinking cute!!! 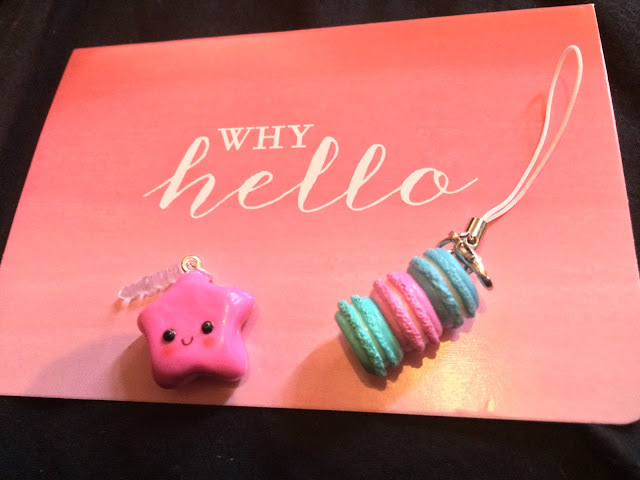 I got a pink Star Dust Plug and a Miniature Macarons Charm in pastel colours which I've already attached to my Kikki K. The quality of these handmade polymer clay charms is superb. They are so amazingly cute and both very well made. It's also worth noting that the postage on these was incredibly speedy. Emma is so lovely and included a gorgeous little card with my order as well. Also, everything was packaged so beautifully with the most gorgeous stickers on the envelope which I'm definitely peeling off and reusing!! Seriously, getting in from a long day at work to this beautiful package decorated with cute kawaii stickers was very much appreciated - Emma definitely puts a lot of effort into her packaging. Moreover, each item came packaged in an organza bag which was wrapped in cute tissue paper. All in all, I really cannot recommend Emsy's Handcrafted Gifts enough. As well as clicking through that link on to her Etsy shop, you can also reach her at Facebook or Bigcartel. I will definitely be a regular at Emma's shop from now on - I really cannot fault her service!